Craps strategy for the Right Bettor,who is a player that wagers with the shooter, hoping that s/he will win the roll. Here is some strategy that may help you stay in the game. For example, if you buy in at a five-dollar minimum table, choose a table that offers at least double odds because the odds bet pays off in true odds, which has no House Edge. I always buy in for a hundred and twenty dollars, which affords a reasonable play session. 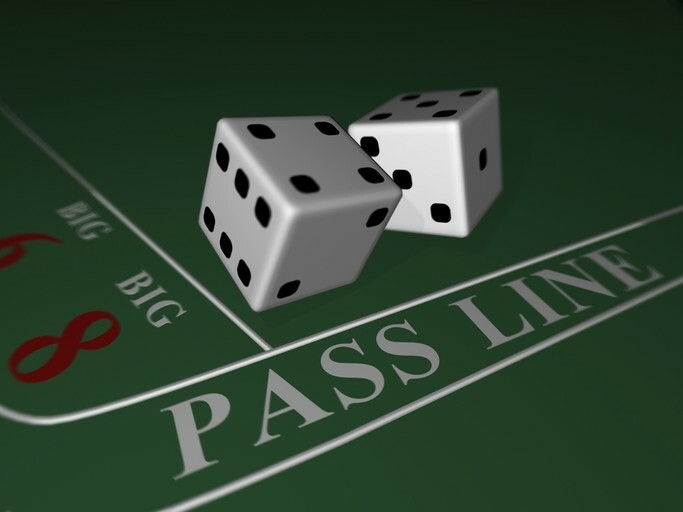 For good craps strategy it’s wise to buy in for at least 20X the table minimum as you want to have at least three numbers working for you during each roll. When you are ready to play, place your money on the table. Casino Etiquette does not allow handing the money directly to the dealer. Ask for 20 five-dollar chips and 20 one-dollar chips. There are concave grooves at the edge of the table for racking your chips. Rack your five-dollar chips and place ten one-dollar chips on each side. Keep a watchful eye on your chips even amidst the roars of the crowd. Sometimes predators circle the crap tables hoping that the excitement of the game will distract the players long enough to swipe their chips. Casino Safety is important to understand. For example, if a 4 is rolled, your five dollars is still active. The 4 becomes the point number. In order for you to win your wager, The 4 must be rolled again before a 7. Always take double odds with your point number. Place ten dollars behind your $5 Pass Line wager for 2X odds. If you win, the payout is in true odds. There are three ways to win with 4 as a point number: 1, 3; 3, 1 or 2, 2. There are six ways to lose with a 7: 4, 3; 5, 2; 6, 1 or 3 ,4; 2, 5; 1 ,6. In other words, there is 2:1 payoff if the 4 comes up before the seven. If so you’ll win twenty-five dollars: five dollars for your Pass Line wager and twenty dollars for your odds bet. After you’ve placed your odds bet, put twelve dollars on the table and tell the dealer to place 6 and 8. He’ll place six dollars on each number. Each time a 6 or 8 are rolled before a 7 or your 4 and you’ll be paid seven dollars. While the place bets are not true odds, it is still a nice payout. You may want to press up one time to have twelve dollars on each number. The objective of this craps strategy is to invite Lady Luck to drop her 6’s and 8’s before your point number is made or the dreaded 7 is rolled. While there are many other Proposition Bets, they have a higher casino advantage and should be avoided. Books, videos, and games about craps can be found on Amazon. Direct link from this page to purchase. Additional publications and videos about casino gaming and other products can also be found at Amazon. Click on the link(s) below to purchase.